Enter to win free money with The Go for Gold sweepstakes. 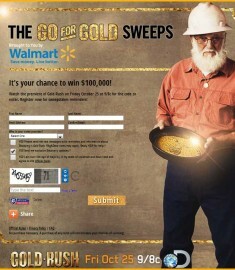 You could win $10,000 of free money with this amazing cash giveaway from the Discovery show “Gold Rush” and sponsored by Walmart. Do not miss out the chance to win some big bucks and make sure you enter before the closing date of October 27th, 2013 at 3.00 am ET. During the promotion make sure you watch Gold Rush on October 25th, 2013 at 9.00 pm ET and collect the code which will be displayed during the broadcast. 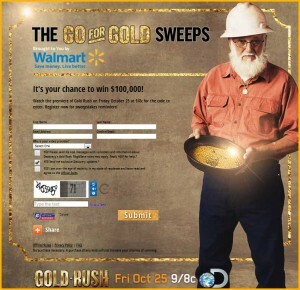 The code will be displayed 4 times during the program and you take the code and enter on the goldrushgiveaway website! The grand prize winner will receive a choice of $100,000 worth of gold or a check for $100,000! You can enter your details now to receive reminders to enter the sweepstakes on October 25th-27th. Free money is always a great thing, and 100 grand is pretty awesome by my standards! What would you do with that much free cash? Buy a car, put down a deposit on a house, go on vacation, pay for college! Gold Rush is the addictive show on Discovery, my husband loves it and honestly I kinda do too! (something I will never admit to my husband!). Something about the digging for gold mentality which brings to mind the American Dream and the endless possibilities for all people! I love the drama and excitement the shows captures! Walmart is one of those stores which literally has almost everything you need and you cannot argues with the super low prices! So enter the cash giveaway today and see if you can live your American dream! ***UPDATE: The code to enter is PAYSTREAK – Now’s the time to enter! I love the Gold Rush shows…can’t wait to see the new season! I want to hurry and start the new season. I love this show I watch every show. I wish I had the money to be able to dream big like todd and parker. I having a GOLD RUSH!!!!!! It would be wonderful to win since I have no job…. we love Gold Rush Alaska. Thanks for the opportunity. So glad you guys did this contest. If I didn’t miss the episodes then, now I’m going to be glued on the couch watching the show. My husband was sooooo stoked that the gold rush show came out. He has been into prosecting twenty years he devoted his life’s savings to it and found very lil gold. He got started with the Tom Massey program gold fever and still love’s to go for the GOLD ! Great show…best reality show on television. I try to watch or record Goldrush every week. I like to se the different types of equipment and how it is being used. Dave Turin seems to be the one that really has it together. I love to watch all the miners in Gold rush, it’s exciting to watch all the guys get through rough terrains,and get where they need to go. Todd, Wish your crew all the luck in the new season. Parker do your grandpa proud it I think he’s the kind of grandpa we wish we all had. Dakota boys I know there’s a mother load gold in that glory hole go get it! Ive been gold mining since 1984. Actually it had a lot to do with my divorce from a woman of 22 yrs. There is nothing like it. I live in so. cal. and mine in the foothills of the sierra nevadas. Hey you dingbats, you use those big machines and move a lot of overburden but when you get to bedrock you move on. What is on your minds? Put a 6 or 8 inch dredge in that hole and get the real gold. Granted, you get the flood gold and lots of it, but put the dredge in and get the nuggets. You are missing the best part. Just a suggestion. Have a great day. Watch out for the mosquetoes. Oh yea I watched the show and missed the code. Aint that the craps? And by the way, this is for the indian creek glorey hole higraders, maybe your misfortunes are due to the way you got that claim. The gold gods dont look favorably on higraders. There is a code you live by in the hills. Just something to think about. This is one hell of a series and every time I watch it I either work on my sluce box or on my wet suit. Im gettin the fever and its only oct. I cant get into my claim until late april or may. Im gold sick. The Hoffmans need to get on the ball or hang it up as minners Todd is a hard head it shows . the code for 1-10-14 is TheVeteren . my husband of 53 years, really like the show Gold Rush,it’s our favorite Show on all of the television has too offer.